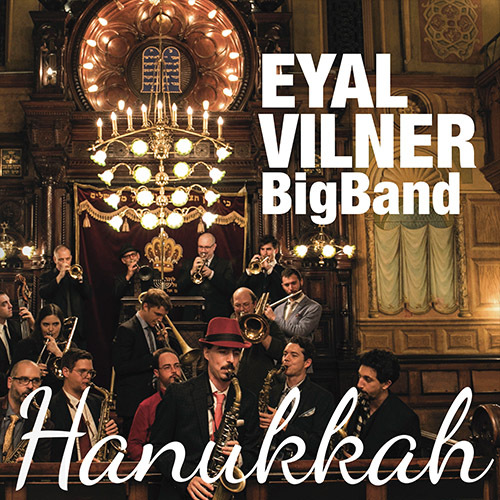 Band leader, saxophonist, composer and arranger Eyal Vilner has released unique holiday album titled, Hanukkah. Presenting six traditional Hanukkah songs (“These Candles” is a bonus track, only available digitally), the album features Vilner’s 16-piece big band, a vocal trio (in the style of the Boswell Sisters) and special guest, Israeli flutist, Itai Kriss. The big band gathered at one of the oldest synagogues in the U.S.to record the album, – the Museum at Eldridge Street, – a National Historic Landmark dating back to 1887 in what used to be a Jewish immigrant neighborhood and is now Chinatown. The style of the album blends the traditional Hanukkah songs with jazz colors and swing, Brazilian and Afro-Cuban rhythms with the ornaments and scales of the Middle East. Vilner is a master at keeping a balance of sophistication and richness of orchestration and counterpoint while keeping the lyrical maturity and class of the original melody clear and in focus. That’s the short of it! -All music was written and arranged by Eyal Vilner (BMI) based on traditional holiday songs. Vilner’s big band brings a fresh and swinging approach to these tunes and each of the six arrangements is an adventure in rhythms and flawless big band playing. The ensemble’s playing in this project is excellent, tight band hits, seamless tempo and style changes, and the horn sections articulations and effects are a real treat to listen to. Vilner’s alto saxophone on “Maoz Tzur” displays his ability as a soloist as well as an exciting arranger. Bringing us a new way to celebrate holiday music, Vilner develops a different side of these classic Hanukkah songs. The playing is excellent throughout, whether it is soloing or ensemble playing, this band is a well-oiled machine. Add to that Vilner’s gift for arranging, and you have an album that is festive, fun to listen to, and will please a wide range of listeners.